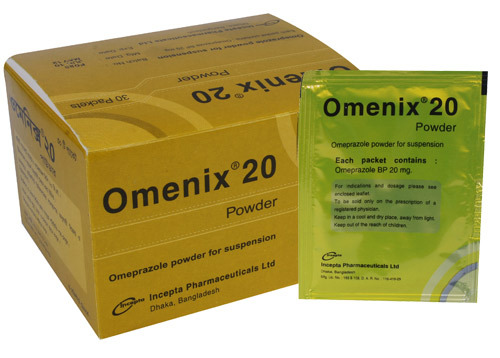 Omenix 20 powder for suspension : Each packet contains Omeprazole BP 20 mg.
Omenix 40 powder for suspension : Each packet contains Omeprazole BP 40 mg.
Omenix 20 capsule : Each capsule contains Omeprazole BP 20 mg as enteric coated 23.5% Omeprazole in pellets. 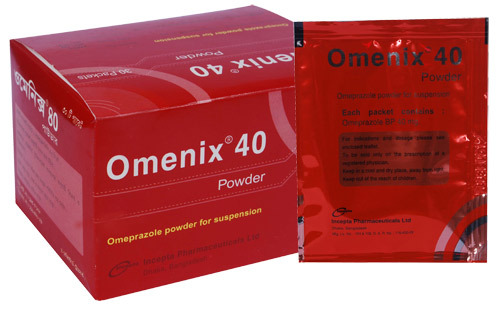 Omenix 40 capsule : Each capsule contains Omeprazole BP 40 mg as enteric coated 23.5% Omeprazole in pellets. 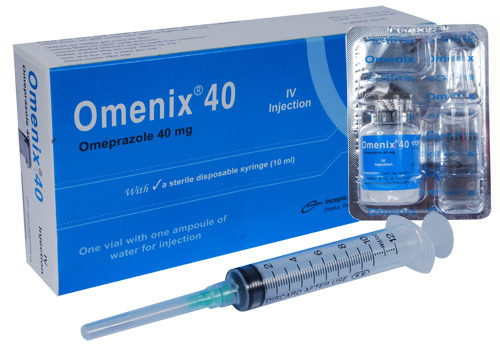 Omenix 40 IV injection: Each vial contains Omeprazole 40 mg (as lyophilized powder of Omeprazole Sodium BP). 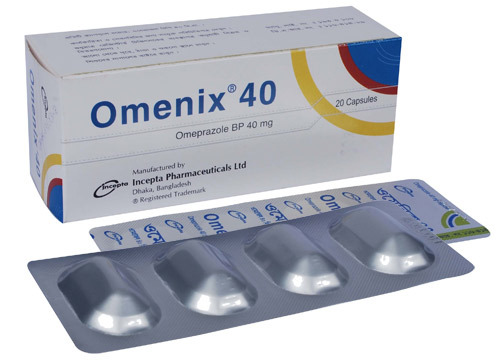 Omeprazole is a substituted benzimidazole that suppress gastric acid secretion by specific inhibition of the gastric acid proton pump (H+/K+ ATPase enzyme system) at the secretory surface of the gastric parietal cell. It blocks the final step of acid production. After oral administration, the onset of the antisecretory effect of Omeprazole occurs within one hour, with the maximum effect occurring within two hours and the duration of inhibition lasts up to 72 hours. The antisecretory effect lasts far longer than would be expected from the very short (less than one hour) plasma half-life, apparently due to prolonged binding to the parietal H+/K+ ATPase enzyme. Following absorption, Omeprazole is almost completely metabolized and rapidly eliminated mostly through urine. Heartburn, Any symptoms of GERD, Erosive esophagitis (both curative and maintenance therapy), Duodenal ulcer, Gastric ulcers, Reduction of risk of upper GI bleeding in critically ill patients. 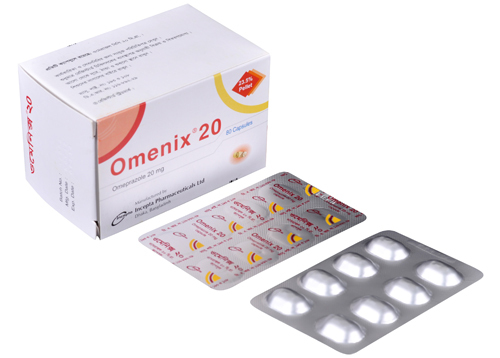 Omenix IV is indicated primarily for the treatment of Zollinger-Ellison syndrome, and may also be used for the treatment of gastric ulcer, duodenal ulcer and reflux oesophagitis. Omenix (Omeprazole) should be taken before meal. No dosage adjustment is necessary for patients with renal impairment, hepatic dysfunction or for the elderly. Duodenal Ulcer: The recommended adult oral dose is 20 mg once daily. Most patients heal within four weeks. Some patients may require an additional four weeks of therapy. Gastric Ulcer: The recommended adult oral dose is 40 mg once a day for 4-8 weeks. Gastroesophageal Reflux Disease (GERD): The recommended adult oral dose is 20 mg daily for up to 4 weeks. Erosive esophagitis: The recommended adult oral dose is 20 mg daily for 4 to 8 weeks. Zollinger-Ellison syndrome: The recommended adult oral starting dose is 60 mg once a day. Doses should be adjusted to individual patient needs and should continue for as long as clinically indicated. Doses up to 120 mg t.i.d. have been administered. Daily dosages of greater than 80 mg should be administered in divided doses. Reduction of risk of upper gastrointestinal bleeding in critically ill patients: The recommended adult oral dose of Omeprazole powder for suspension is 40 mg initially, followed by 40 mg after 6 to 8 hours as a loading dose on the first day, then 40 mg once daily for up to 14 days. The use of Omeprazole powder for suspension in critically ill patients beyond 14 days has not been evaluated. In patients with duodenal ulcer, gastric ulcer or reflux oesophagitis where oral medication is inappropriate, Omeprazole IV 40 mg once daily is recommended. In patients with Zollinger-Ellison syndrome the recommended initial dose of Omeprazole given intravenously is 60 mg daily. Higher daily doses may be required and the dose should be adjusted individually. When doses exceed 60 mg daily, the dose should be divided and given twice daily. Impaired Renal Function: Dose adjustment is not needed in patients with impaired renal function. Impaired Hepatic Function: As plasma half-life of omeprazole is increased in patients with impaired hepatic function a daily dose of 10 - 20 mg may be sufficient. Elderly: Dose adjustment is not needed in the elderly. Children: There is limited experience with Omeprazole IV in children. Omeprazole is well tolerated and adverse reactions have generally been mild and reversible. Side-effects may include headache, diarrhoea, constipation, abdominal pain, nausea/vomiting and flatulence, dizziness, paraesthesia, somnolence, insomnia and vertigo, increased liver enzymes, rash, dermatitis and/or pruritis, urticaria, Malaise. Others include hypersensitivity reactions e.g. angioedema, fever, bronchospasm, interstitial nephritis and anaphylactic shock. Symptomatic response to therapy with Omeprazole does not preclude the presence of gastric malignancy. Immediate Release Omeprazole formulations contain sodium bicarbonate which should be taken into consideration for patients on a Sodium-restricted diet. Pregnancy: There are no adequate and well-controlled studies on the use of Omeprazole in pregnant women. Therapeutic doses during pregnancy are unlikely to pose a substantial teratogenic risk. Omeprazole should be used during pregnancy only if the potential benefit to pregnant women justifies the potential risk to the fetus. Lactation: Omeprazole is excreted in human milk. Thus, a decision should be taken to discontinue nursing or to discontinue the drug, taking into account the importance of the drug to the mother.